Billy Goat Bucks Pokie Review - Play Today! This is a slot game created by International Gaming Technology, a company known to be one of the world’s leaders for providing land based slots to casinos from all over the world and they have also started to offer online slots during the last few years. This game was created especially for those seeking to play a game with a farming theme. In order to get one of the best gambling experience, IGT always manages to make the right combination between some high quality video graphics and entertainment. Billy Goat Bucks is a game that can be found in land based casinos from all over the world, but at the same time there are also plenty of online casinos that offer this game. 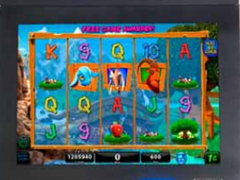 Billy Goat Bucks is a modern video slot game that was created especially for the casual players that would like to find a happy theme and at the same time get the potential to win big. In order to achieve the biggest wins while playing Billy Goat Bucks video slot game you need to hit those special symbols and features. One of the symbols that should always bring happiness to any slot player and that at the same time can provide you with an excellent set of winnings are the Stacked Wilds. They come in shape of a huge troll and they will enhance your payouts every time they appear on the reels. However one of the most intriguing thing at Billy Goat Bucks is the bonus round. This game features a free games bonus and this means that you should be able to start spinning the reels for free and keep the winnings. In order to trigger this special feature you need to have three goat symbols on the reels. This feature can get retriggered and this means if during the free plays you get two additional goats symbols on the reels you get an additional free game. However if you are lucky enough to get three goat bonus symbols on the reels, then the “Spinsplosion” feature is enabled and there you have to play a small bonus pick game where you have to pick one of the goats you can see on the reels and win between 5 and 50 free spins. This special feature can also get retriggered during the free plays and the maximum number of spins you can get goes up to 201. Another thing that should enhance your winnings is the troll stacked wilds that will become sticking wilds and remain on the first and fifth reel for as long as you play the free spins. This can seriously increase your winnings. Billy Goat Bucks is a really entertaining slot game and you get to trigger the free spins bonus games a lot. There are 5 reels on which you can activate up to 60 pay lines. In case you play the maximum number of paylines then you have some good chances of triggering the free spins feature. In fact the hit frequency percentage is 48%.